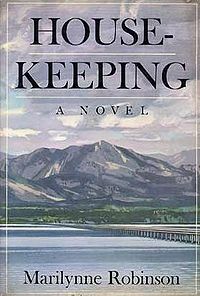 Housekeeping coming this early in my 2012 booklist might create the mis-impression that I am a person who goes crazy and raves over every book I read. Not so. “Might be the best book I’ve ever read” is not something I say all the time, or even once every few years. I might say it once a decade. And, so, that said, Housekeeping is one of the most unstoppable works of genius, in terms of contemporary fiction and sheer prose that I’ve ever read. This book is an utterly gorgeous meditation on existence played out around a frozen little town in the hills on a big lake, with a railroad trestle suspended between the two elements of air and sky. If anyone has ever described water, reflections, luminosity, air, sky and cold better, I have not read it. It’s like she’s exploring the poles, but I don’t think she resorts to that obvious comparison, and the poles are interior, anyway. This is one of those books that unspools, sentence by sentence, becoming relentlessly stranger and more beautiful until you realize, way too late, that it’s been taking you somewhere frightening. I was not ready to get quite this cozy on cold shoulder of nothingness. But then again, it’s actually a lovely family story. It was interesting to read it right after Revolutionary Road, since they’re both limited-character set pieces with claims of being domestic, but the Yates was a nasty little suburban drama about trite, shallow people whose most interesting quality is being tormented by their own triteness. Housekeeping answers the questions about the meaning of life that the Wheelers might have liked to ask if they weren’t such horrible people. I’m posting to a Paris Review Q&A with the author as well, since those tend to be quite good. She’s written only two other books (Housekeeping was her first, published in the early 80s) and I plan to read them both. ← 3. Revolutionary Road, Richard Yates.